BRANDON – Brandon University (BU) Sociology professor Dr. Christopher J. Schneider has received national recognition for his efforts in public education. 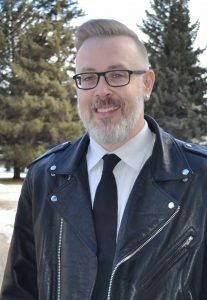 Dr. Christopher J. Schneider is a recipient of the Public Education Award, presented by the Canadian Criminal Justice Association. Founded in 1919, the CCJA is a national independent organization working for an improved justice system in Canada. Hirsch Greenberg, President of the Association, presented Schneider with the award recently at the CCJA biennial Congress in Toronto. Schneider’s public education endeavours are multifaceted and extensive in reach across diverse groups. Schneider has provided numerous public lectures, sat on public panels, and has given educational presentations for criminal justice professionals across Canada. He regularly engages with media and has given more than 450 interviews in the last eight years with media, including the New York Times, Globe and Mail, CBC’s The National, and SiriusXM Satellite Radio. More than three-dozen of these interviews were in the aftermath of the 2011 Vancouver riots, during which Schneider urged restraint and the importance of due process in response to calls for swift justice, as well as for caution in response to social media materials, which might appear to incriminate people. 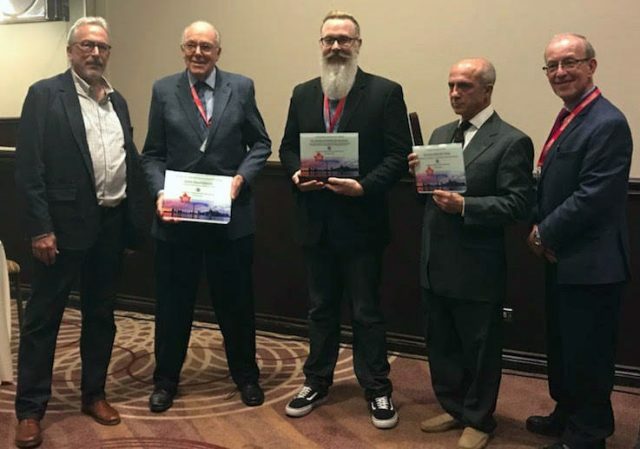 Pictured, from left to right, at the Canadian Criminal Justice Association biennial Congress in Toronto are: CCJA President Hirsch Greenberg, John Braithwaite (recipient of the Willie Gibbs Lifetime Achievement Award); Christopher J. Schneider; a representative of the William Head on Stage theatre Company (Anthony Holland Award recipient); and CCJA Executive Director Irving Kulik. Schneider’s research also is regularly spotlighted in news media; including his published work on the 2011 Vancouver riots, and, more recently, discussions of his latest and well-received book Policing and Social Media: Social Control in an Era of New Media (2016, Lexington Books | Rowman & Littlefield). The book was recently featured in a one-hour CBC Documentary “Enforcing the Message: How Police Are Communicating with the Public.” The book has also been reviewed in Maclean’s, the Vancouver Sun, and profiled extensively on talk radio stations across the country, including in 22 nationally syndicated interviews on CBC Radio. “Through his research, Dr. Schneider has provided us with a new lens for viewing modern police work and the criminal justice system, in particular their use of technology and social media,” says Dr. Demetres Tryphonopoulos, Dean of Arts at BU. “His commitment to analyzing and interpreting the social outcomes of these new approaches is of great public value, and our students benefit tremendously from his critical thinking and shared insight. Consistent with his outreach efforts, Schneider has directly engaged the public in the areas of sociology and criminology. For instance, he pioneered a course that encouraged members of the public to attend class with students. The course design – published in a co-edited book on public sociology — has been replicated across Canada. Schneider also actively encourages and educates others on how to share their research, having published a few “how-to” guide papers for scholars, students, and practitioners who wish to promote their research in media.